I grew so many peppers this year that I've been trying to find all kinds of things to make with them. One of the things I did was dehydrate and grind them into a powder. I grew a couple peach peppers this year that were very productive, Sugar Rush Peach and Jays Peach Ghost Scorpion. I made a peach hot sauce I call Paula's Peach Pain Sauce as well as a peach colored chili powder I call Paula's Peach Pain Powder. 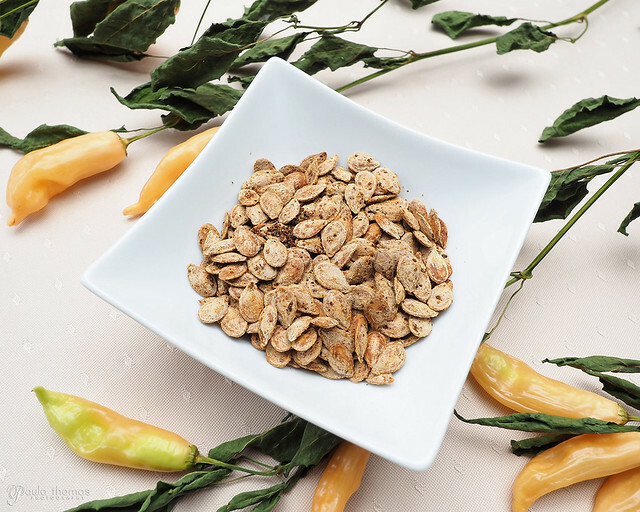 I used the peach powder to make these chili roasted pumpkin seeds which are crunchy and spicy, very addicting. You can use any chili powder you'd like for this recipe and make it however hot you want by adjusting the amount of cayenne or other hot powder you decide to use. 2. Bring the salt and water to a boil, add cleaned seeds and boil for 10 minutes, stirring occasionally. 3. Drain seeds and dry on a paper towel. 4. Put seeds in a small bowl and drizzle with oil. Stir in the sea salt, garlic powder and all chili powders. 5. Spread seeds on a foil lined baking sheet and bake for approximately 30 mins, stirring and turning seeds every 5-10 minutes until lightly browned and crispy. 6. Remove from oven and let cool. Store in an air tight container.